September 1943. 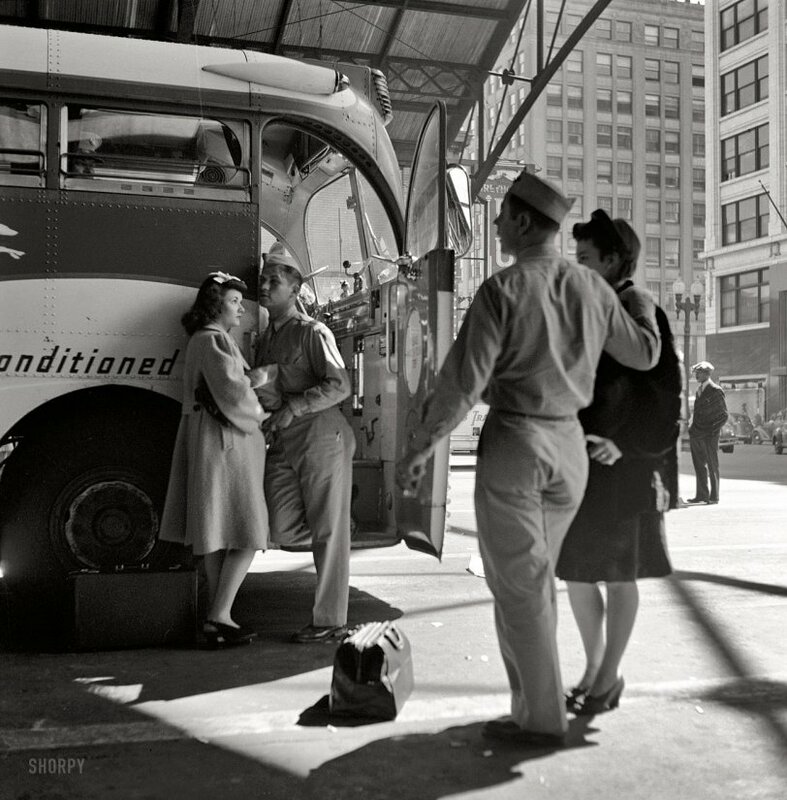 "Soldiers with their girls at the Indianapolis bus station." Medium-format nitrate negative by Esther Bubley, OWI. View full size. Submitted by Dan in Lafayette on Tue, 12/01/2009 - 9:35pm. I believe the interurban and bus stations were on the north side of Market Street between the Civil War Monument and the State Capitol. I recall the electric trolley buses as a child when my dad took me to Indy, about 1959, to pick up a family member coming home. Submitted by John W from Broad Ripple on Sat, 10/17/2009 - 5:23pm. Wonderful picture! Some 10-12 years later in the mid-50's (I was about 8 or 9 ) my father and I took a bus trip from that terminal (we lived in Broad Ripple). I recall him reminiscing about the "boys that left from here to go to war." Especially about a neighbor of his in Broad Ripple that he saw off on the bus, bu never came back from the South Pacific. I can sense the sights and smells of that Terminal as if I were standing in it now! Submitted by Lost on Wed, 04/22/2009 - 4:08pm. Submitted by Anonymous Tipster on Wed, 04/22/2009 - 4:06pm. His never ending love soothes my aching soul. When his loving brown eyes leave mine my lovely life will become dim. Submitted by Anonymous Tipster on Wed, 04/22/2009 - 12:46pm. Submitted by Emma M. on Tue, 04/21/2009 - 10:46am. This makes me unbelievably sad. I hope they got to see each other again. Goodbyes and off to war. Submitted by Seattlekid on Tue, 04/21/2009 - 10:02am. I think I am more emotional now seeing these pictures and thinking back to that time when my beautiful bride of two years and I said our goodbyes at the train station in Detroit in 1944 than I was at the time. I do wish we could know what happened to these young people. Submitted by timt on Tue, 04/21/2009 - 9:10am. I took a Greyhound bus ride when I was a small child and that smell of diesel and the inside of the bus still comes back to remind me of that trip when I was 5. This picture is amazing. Submitted by tterrace on Tue, 04/21/2009 - 8:28am. Foy's olfactory reminiscence inspires this comment. I was recently reminded of what the inside of a long-distance bus smelled like. An acquaintance recently bought a slightly used car that had been briefly owned by someone who was apparently the world's heaviest smoker. Despite the dealer's attempts to deodorize it, the first thing that came welling up within me when I got in it on a hot day was a long-buried memory, and I thought "Greyhound bus, 1955." Submitted by Foy on Mon, 04/20/2009 - 11:12pm. I think I've looked at this picture for 20 minutes, at least -- encouraged by thoughtful, relevant information like his unit and/or where they might have gone. I can almost hear the big diesel idling from the back of the bus and smell the musky interior of vinyl seats and frequent use. Submitted by gas pumper on Mon, 04/20/2009 - 2:39pm. The Super Coach, put into production in the spring of 1936, was made until 1939. Close to 1,600 of these buses (Models 719 and 743) were constructed by Yellow Coach of Pontiac Mich., virtually all of them sold to Greyhound or its affiliates. Some of the last of these buses were delivered with air-conditioning in 1939. Many older ones were refitted with AC systems. (From "Over the Road" by Meier and Hoschek). Submitted by Paco on Mon, 04/20/2009 - 2:36pm. Por aquellos años, en Europa los autobuses eran mucho menos futuristas, éste parece de ciencia ficción. Hermosa y magnífica fotografía. ¡ Bravo, Esther ! Submitted by Anonymous Tipster on Mon, 04/20/2009 - 11:05am. That Marine on the bus looks homesick already. Submitted by Anonymous Tipster on Mon, 04/20/2009 - 9:25am. The GI standing at the bus door is wearing the triangular patch of the 83rd Infantry Division, which trained at Camp Atterbury, Indiana. The 83rd entered Normandy during the latter part of June 1944 and lost thousands in the hedgerow fighting. Submitted by bhappel on Mon, 04/20/2009 - 10:17am. It appears that the Hilton hotel and parking garage to the west of the Hilton occupy the former Traction Terminal location. In the middle of the Google map and the image of the soldiers at the bus station is the Illinois Building. Submitted by Anonymous Tipster on Sun, 04/19/2009 - 10:21pm. These types of photos always make me think I'm looking at a movie still. I can never believe people actually looked like this. Submitted by MianLove on Sun, 04/19/2009 - 7:53pm. I like how the woman in the dark coat has her finger hooked in the back pocket of her man. Submitted by Julie on Sun, 04/19/2009 - 7:41pm. I live near Indianapolis. I wish I knew where this was taken. From the little bit we can see, I'd assume it was taken somewhere near the circle and the circle monument. Submitted by loribl on Sun, 04/19/2009 - 6:28pm. These pictures always make me sad. I wonder if the men came back, if their girls were waiting for them ... well, you get the idea.